Capsiplex is arguably the original ‘chili fat burner‘ that has been responsible for forming the basis of many similar products. In our opinion it is the most effective non-prescription fat burner, it is often copied but rarely matched let alone bettered. It is the creation of a British company and is now a top seller in many countries including the US, Canada, Australia and several European countries. It is a truly an inspirational product and one that the UK can be be proud of. Positives: Based on 30 years of research, clinically proven, many success stories. Negatives: Choice of celebrity endorsements questionable. 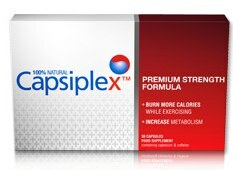 Unlike the seemingly endless new introductions to the diet pill market, Capsiplex has a fairly simple mechanic of action – it burns fat. It does this rather well. Capsiplex works and for this it will cost you around £30 a month – or £1 a day. After 6 months of using the product you will hopefully (if you are serious about losing weight) never have to use it, or any other diet product again. Your body should be accustomed to wanting less food. The Capsiplex formula is based on 30 years of research, clinical studies and human trials. There is an undeniable link between capsicum and weight loss. The formula is based around the key ingredients of Capsicum Extract, along with Niacin, Caffeine and Piperine. Capsicum, also known affectionately as chili pepper is a thermogenic fat burner that can raise the core temperature of the body which in turn burns calories. It can do this without the need to exercise. The manufacturers do stress that exercise while using the pill is the preferred combination. As we have mentioned, capsicum has a proven link to fat burning and weight loss – but you would have to literally eat 10 grams every day to gain the same effect as taking Capsiplex as suggested. When it was first introduced there was an almost ‘iPhone-esque’ hysteria surrounding it. 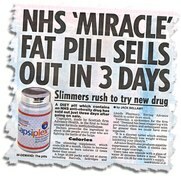 Several newpapers (Daily Mail, Daily Express etc..) featured articles exclaiming that the miracle fat burner was available to buy soon without prescription. 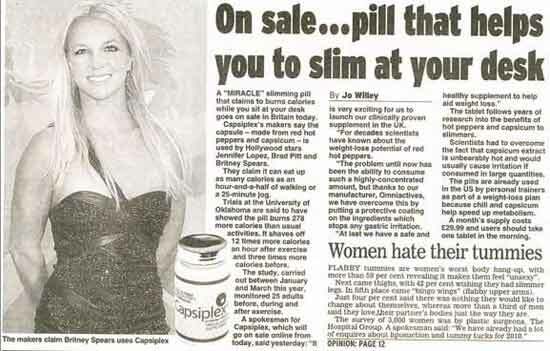 A purported 50,000 units were sold in advanced orders prior to its shipping date as dieters rushed to buy it. Stock levels were depleted after just 3 days of its official release. There have also been several high profile celebrities associated with the concept of using chili pepper to burn excess fat levels including Brad Pitt, Angelina Jolie and Britney Spears – these stories also made the headlines. In its marketing material Capsiplex often use an infographic that compares the effect of taking one capsule to jogging for 25 minutes or 40 minutes of cycling. Eating too much chili (capsicum) will often lead to gastric irritation – this is another reason why Capsiplex is the most sensible way to introduce the benefits of chili to your body. It is available to buy direct from its official website. It costs £29 for a months supply or the original and £42 for the newer enhanced version with 5HTP. It is highly advisable to avoid buying Capsiplex from eBay and Amazon, especially from third party sellers as could be buying un-authentic and possible counterfeit produce. The official website has promotions and discounts from time to time.